Hi friends, I am writing you after a busy week working with Access Magazine and New Orleans Fashion Week! It’s been a heck of a week, but I’m happy to get settled back in. Before I walked the runway in the New Orleans Fashion Week Kick-off event, my brother’s girlfriend, Mackensie, joined me for a fun day walking the streets of Nola, eating and drinking up the culture. (All photos courtesy of Mac). We ate at Auction House and it was DIVINE! I was so excited to finally get to wear this outfit. It was perfect for a Sunday afternoon stroll. I am a huge fan of ruffled skirts and heres why.. 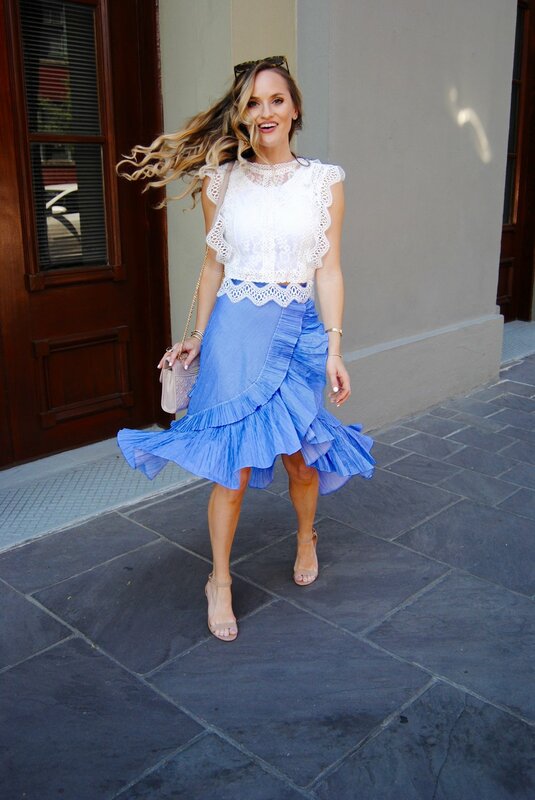 Adding some random symmetry to your look can make you look super stylish, and a ruffle skirt can do just that! Depending on the length, these babies can be styled quite differently in their own way. They are so easy to pull off for a flirty, feminine look. In the history of skirts, this one from Chicwish is my FAVORITE of all time. It really is the epitome of effortlessly chic. I am wearing a XS so it fits better around my waist. I paired this look with an open-toed heel for a more elegant and dressed up feel. The white crochet top is also the perfect topping for clean tasteful style. I would wear this outfit to brunch with friends, to a day at the park, a gathering, dinner… Moreover, it’s so versatile that I would even wear this to Easter Sunday! This is a must have closet staple for spring soirees. Thank you Chicwish for keeping me Chic! !